Last Thursday, we saw it. My wife laughed and eye-rolled and wiped away tears at the exact moments the filmmakers intended. I, on the other hand, couldn’t turn off my brain and enjoy the movie. I knew too much. I understood the winks and cultural references that grazed over my wife’s non-Chinese head. By the end credits, I wasn’t focused on the contrived narrative devices that too neatly tied a bow—all I could think was parts of Crazy Rich Asians were so scary realistic, it should’ve been labeled a horror film. There are members of my extended family who are, in fact, crazy rich. No one, thank Buddha, reaches the heights of wealth-flaunting and face-saving paranoia as the Young family portrayed in the film. But there’s just enough judgment, just enough gossiping aunties, just enough purse-lipped, silent disapproval to give me the flashbacks. 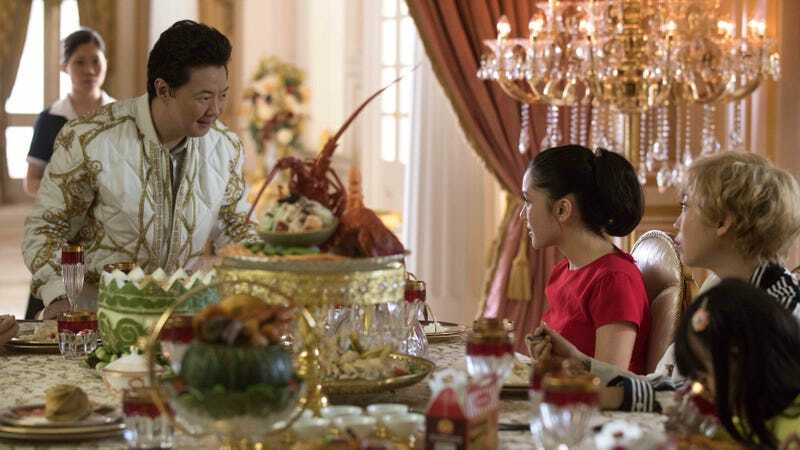 What Crazy Rich Asians also gets frighteningly accurate is our obsessive relationship with food. In Cantonese (one of the dialects spoken in the film), our preferred expression of greeting is “Have you eaten yet?” It’s one of the first sentences uttered to Rachel Chu (Constance Wu’s character) the moment she steps off the plane at the Singapore airport—not “let’s first check into the hotel to freshen up,” but let’s immediately stuff our faces with satay and laksa and curry crab after a 19-hour flight. And stuff themselves they do, four models with sub-five percent body fat eating an obese family’s spread at Newton Food Centre, the famed outdoor food market. The act of eating is our firm handshake. I recognized in the film our predilection for smothering family not with outward expressions of love, but through food. Fish head curry as proxy. We love you, so here’s the choicest piece of chicken, which we’ll put on your plate and you eat it now or else it’s a sign of disrespect. I recognized the ostentatious displays of spiny lobsters and ornately carved winter melons, served not just for its deliciousness, but as a status symbol to prove that they could afford this lavishness. I recognized the 8-year-olds transfixed on their PSP and iPads while the adults eat the spiny lobsters and ornately carved winter melons. I recognized the Chinese mother version of ice-cream-to-make-you-feel-better: herbal chicken soup. I recognized the middle-aged “aunties” who use “you’re too skinny!” as a pejorative to younger women for not eating enough, ipso facto, they’re not ready for child-bearing. But the part that brought back memories of unease and nervousness is the scene where Constance Wu’s character is ingratiated into her boyfriend’s family through the ritual of communal dumpling-making. The first time I brought my Irish Catholic-girlfriend/now-wife to meet my parents was eight years ago. I was a ball of nerves, and wasn’t able to sleep the night before. How would my folks judge her? Would they shoot me a look of purse-lipped, silent disapproval? The door to our house swung open and there was mom, her apron caked with flour, with two outstretched arms, beaming. Unlike Michelle Yeoh’s character in Crazy Rich Asians, there was no judgment, hesitation, or once-over of the gwai lo. Just forward momentum, then a maternal squeeze to each of us. Mom led us into the kitchen, where my parents were wrapping dumplings. Dad stood hunched over the counter eyeballing soy sauce, Shaoxing rice wine, and cornstarch into the ground pork and mixing with his hands. Instantly, my girlfriend was entranced. It was like one of those Saturday afternoon cooking shows on PBS, but in living color. She peppered Mom with questions: What are these called in Chinese? What’s in the filling? How do you fold these? Soon after, my girlfriend had donned an apron and was folding dumplings with my folks. Here they were, Chinese mother and future Irish-Catholic daughter-in-law, a first impression via dumplings. Fast forward eight years. We’re now married. Our two-year-old son was asleep at home while my mother-in-law house-sat. My wife and I were sitting in a movie theater on a Thursday night, having just watched a scene about Chinese elders passing on the tradition of dumpling-making, in a film that for her was a bubbly rom-com but for me brought back fears of judgment, cultural expectations, and bloodline fealty. My wife elbowed me for some reason. I looked down: My right hand had a hell-grip on her knee.